One of the biggest mistakes made by business analysts is going into “solution mode” before they’ve fully analysed a problem. They either approach a client meeting with pre-conceived ideas on what will fix the problem or jump to conclusions during the investigation phase without understanding all the underlying issues. We can all be guilty of this and sometimes the more experienced the analyst, the more prone they are to fall into this trap. Why is this so? When you work constantly with technology you know that in most cases the answer to a client’s problems is going to have an IT component, usually a significant one. Surely it’s just a question of using the right technology – after all isn’t IT embedded into everything we do? Before you know it you’re looking at what technology your company has and how this “solution” can be utilised by the client. But are you solving their problem? As is often the case, the richness of the English language is both a blessing and a curse. The same word can mean different things to different people. In the world of IT, a solution is synonymous with how a system is implemented rather than what it does. What might then make matters worse is that every IT system has its own constraints and limitations. We’re already putting boundaries around potential “solutions” to our client’s business problem. For a client however, a solution is what solves a business problem. Solving the problem might involve a change in procedures, a change of staff, a modification to the company’s business rules – a change to something that might have nothing to do with technology. It just comes down to keeping a clear head when using words. 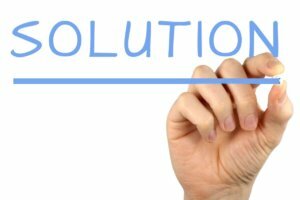 The “solution” to a business problem can be defined as what the client will do to address their problem or opportunity. This is often achieved, but not always, by implementing technology changes.